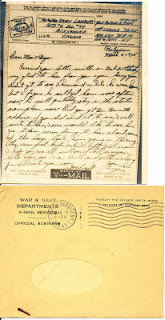 WWII Letters: WWII V-Mail Letters Some Examples, Magnifier, and information. 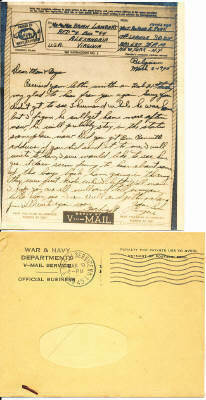 WWII V-Mail Letters Some Examples, Magnifier, and information. World War Two tested America’s resourcefulness in many ways. It forced us to find better ways to do things to conserve fuel, and other commodities. One innovation was the V-mail. The V in V-mail stands for Victory. By starting with normal sized paper for the sender to write on, the V-mail was then photographed, and put on microfilm. The microfilm was then mailed to processing center, to be printed on a still small sized V-mail letter. The letter was then folded to allow the recipients address to show through the window. The space saved, allowed for shipment of other war related materials. The envelope that the V-mail letter was mailed in, measured about 4 3/4 inches by 3 3/4 inches. The first V-Mail, shown above right, is a standard V-mail letter, with the Censor's stamp in the upper left corner, the recipient's address in the middle top, and the sender's address in the upper right corner. Belos is an example of a letter inside it's envelope. That particular letter was written by a Sgt. who was in Belgium, in March 1945. It looks like he was in the 17th Service Squadron. This is a photo of a box that contains a V-mail Magnifier. top of the V-Mail, on a flat surface. This view shows the Magnifier in the Box. 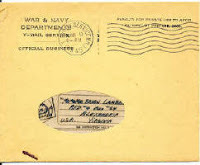 V-Mail from WWII. As you can see, it does make some difference. I still prefer to use an old magnifying glass with a handle though. This V-mail was sent by a soldier in Britain, in 1943. He was in the 14th R.C.O. Squadron A. Flight-1, during WWII. This V-mail was sent by a soldier who was "Somewhere in England", during WWII. 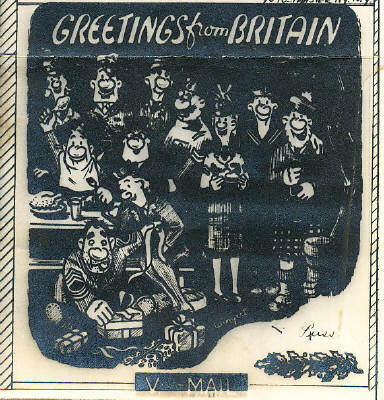 This V-Mail sends "Season's Greetings from Great Britain", by a soldier serving there, during WWII. Bought a collection a few years back as an investment. Fell in love with it, only then appreciating that behind that medal and documentation is a long story and a real person. Proud owner of over 200 V mail letters sent to my dad during WWII. I didn't know people were collecting them. How much are they worth? I own over 200 v-mail letters. Are they valuable? As far as value goes, most of them don't have a whole lot of monetary value, but a few of the illustrated ones can sell for 10 or 20 bucks sometimes. But they all have historical value, and if they are part of your family history, I would say they are priceless. I think it depends on what is written about in the V-mail too. I saw one single V-mail that mentioned the atomic bomb go for over $20, maybe $30 on ebay. Very true Sarah.....rarity can make a big difference.